Ski and snowboard season is just around the corner and as Metro Vancouver prepares for another blustery winter, the local hills are getting ready to welcome the Olympic-sized crowds that will be flocking to the hills. Here’s how many of them are using social media to keep the public informed about events, activities, and conditions. Will be open 24 hours a day during the Olympics, even hosting NBC’s Today Show for a few weeks — can you say 4am Tweetup on the slopes? Host of the 2010 Olympic Winter Games. 90% of their runs will be open to the public during that time. 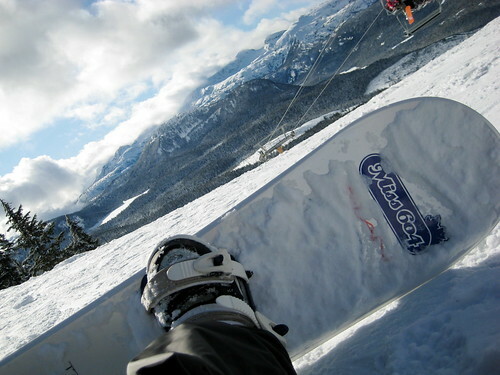 Your ultimate ski/board destination on Vancouver Island. Check out Keira’s posts for everything you need to know about Mount Washington. I’m celebrating my 16th year as a snowboarder so I can’t wait to get in as much riding as possible. With the local mountains getting snow this morning opening day isn’t too far down the road. Should you have any listings you would like to add to my directory above, please feel free to leave a comment or email me through my contact form. 16yrs? wow! We’ll have to meet up for sure so you can teach me a thing or two about shredding the gnar!. I think this marks my 3rd season riding. It’s cool seeing the mountains on twitter, well social media in general. Woah! They’re going to be open 24 hours? That… is… AWESOME! I have been riding since I was 13 – I am going on my 14th season!!!! Awesome post! Thanks for including all in one place. Good post about the ski areas and would like to add or mention another twitter @snow_on_my_car as this person reports every morning for weather or snow changes. @Aidan, Seymour and Grouse will be under a lot more pressure than usual, but I believe both mountains are prepared for it. There has been research done, looking into the volume that local ski resorts receive during the Olympics in host cities. For the most part, ski visitors drop off during the actual two weeks of the Olympics as most people are participating in events and festivities that the Olympics offer. It is the weeks pre and post Olympics that we expect to see our largest volumes. The concern for Seymour is that it will be the only “free” way to drive up, see the snow and have a great view of the city. This means we expect large volumes of traffic; however does not necessarily mean long lift line up’s! For the most up to date traffic conditions and snow fall reports, follow @MtSeymourRoad on twitter. Thanx for the sweet collection all together. Best use of Twitter yet â€“ the Mt Seymour Road tweets. Hopefully all the hills will set up a road conditions specific Twitter account. Mt Seymour can barely handle a heavier than average day, so this is going to be a testing year for all of us. Mt Baker here we come! Just not sure that the 3+ hour wait at the border during the Olympics is even going to be worth it. Thanks for another great post Rebecca. I learned to ski on Mount Seymour in the early 70’s and haven’t been back for many years. Looking forward to the ski season “I have never tried boarding” in Vancouver and area and so far mother nature is cooperating. Whistler opening today and I see the snow line is getting low on the local Vancouver mountains. Here’s hoping we get a good base on all the mountains and really show the world something special during the 2010 Winter Olympics. Revelstoke Mountain Resort is just off Highway 1 in Revelstoke, BC. We love using social media tools to connect with riders!